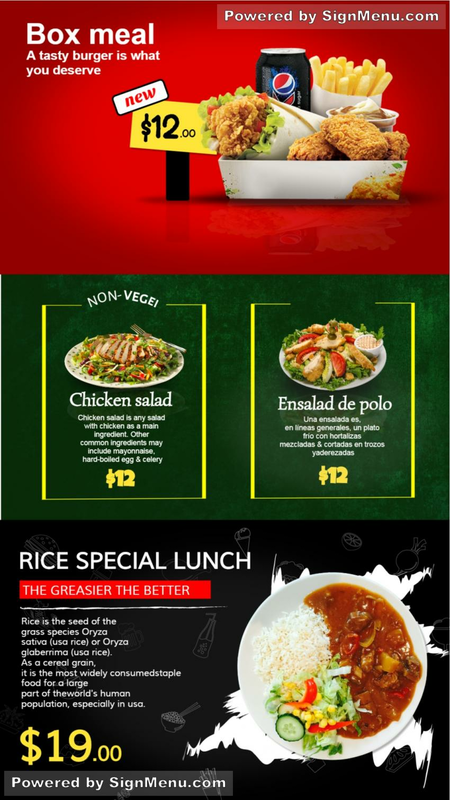 Signmenu : Digital signage Template for a lunch menu restaurant. This template is best placed on a digital screen at the entrance as well as indoors of the quick service restaurant. These restaurants with selective items on menu are much in demand in the business district of any city as they mainly cater to the office going crowd. Office goers, whose lunch times are limited, will be inclined to have a bite at this restaurant. And the digital screen will display the items prominently. The restaurant can charge 5% -10% extra if the demand is good and trendy. This template is ready for download and use.